- Text discussions provide structural details in the context of their functional significance to integrate coverage of anatomy and physiology in each chapter. Integration of Body System Relationships: Understanding how systems function together is critical for student success in A&P. To emphasize the interdependence of body systems, McKinley/O'Loughlin/Bidle weaves prior coverage of one system into textual explanations of how other systems work, and also highlight these relationships in “Integrate: Concept Connection” boxes. Brief notes foreshadowing how a concept will come into play in later chapters are also used. In addition to system relationships, key cellular and chemistry themes are also referenced whenever a reminder of main principles clarifies a new concept. Integration of Anatomy and Physiology coverage: Anatomy and physiology are intimately related. Discussing form with function gives students the “big picture.” Text discussions provide structural details in the context of their functional significance, and, conversely, discuss complex physiology while referring to the anatomical features that play a part in each mechanism. Integration of Facts and Applications (this is where you want to go to show clinical content): Both the text and artwork are flavored with real-life examples that present the facts of A&P in a familiar and relevant context. In addition, “Integrate: Clinical View” boxes apply chapter content using clinical examples that show students what can go wrong in the body to help crystallize understanding of the “norm.” Clinical scenarios are also used in “Can You Apply What You’ve Learned?”, and “Can You Synthesize What You’ve Learned?” question sets. Lastly, Career opportunities pursued by students studying A&P are highlighted at the beginning of each chapter. Integration of Text and Media: The McKinley/O'Loughlin/Bidle media package utilizes McGraw-Hill's Connect and ConnectPlus ebook to bring together question banks, animations, and tools like Anatomy & Physiology Revealed and LearnSmart in a usable way organized around textbook learning objectives. The textbook includes icons that denote corresponding media assets and a summary of media tools at the end of each chapter. Alignment of Textbook and Lab Manual: The lab manual authors, Christine Eckel, Kyla Ross, and Theresa Bidle, wrote the lab manual to complement and extend the concepts presented in the textbook. The main text and LM share many similar pedagogical features for a unified experience. 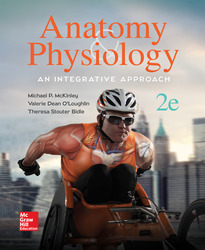 Integration of Anatomists and Physiologists in Author Team: The authors of the textbook and lab package include two anatomists: Valerie O'Loughlin, Indiana University, and Christine Eckel, Carroll College; and two physiologists: Mike McKinley, Glendale Community College, and Terri Bidle, Hagerstown Community College. “Integrate: Learning Strategy” boxes. An integration of practical learning examples into the textbook. They might be pneumonic, or visual, or they might be a practical classroom-tested learning device to cut through all of the jargon. This title includes Connect with LearnSmart – an online assessment tool featuring McGraw-Hill's unique adaptive, diagnostic learning tool – LearnSmart. Integration of Visuals and Text: All figures in McKinley/O'Loughlin/Bidle are carefully designed to support the text narrative. Brief textual explanations are included within artwork, making figures self-contained study tools. Special “Integrate: Concept Overview” figures tie together multi-faceted concepts by bringing the various pieces of a concept together in captivating one- or two-page visual summaries. Seeing all of the parts together in one place solidifies the information presented in preceding sections. Michael P. McKinley received his undergraduate degree from the University of California, and both M.S. and Ph.D. degrees from Arizona State University. In 1978, as a postdoctoral fellow at the University of California at San Francisco (UCSF) Medical School, he investigated prion-diseases. In 1980, he joined the anatomy faculty at the UCSF Medical School, where he taught medical histology and authored or co-authored more than 80 scientific papers. Joining the biology faculty at Glendale Community College from 1991 to 2012, Michael taught undergraduate anatomy and physiology, general biology, and genetics. Between 1991 and 2000, he researched Alzheimer’s disease while teaching developmental biology and human genetics at Arizona State University, West. His vast experience in histology, neuroanatomy, and cell biology greatly shaped the content in Anatomy and Physiology. Retiring from active teaching in 2012, he continues to be an active member of the Human Anatomy and Physiology Society (HAPS). Theresa Stouter Bidle received her undergraduate degree from Rutgers University, her M.S. degree in biomedical science from Hood College in Maryland, and has completed additional graduate coursework in genetics at the National Institutes of Health and in science education at the University of Maryland. She is a professor at Hagerstown Community College, where she teaches anatomy and physiology and nutrition to pre–allied health students. She also mentors new full-time and adjunct faculty who teach anatomy and physiology. Before joining the faculty in 1990, she was the coordinator of the Science Learning Center, where she developed study materials and a tutoring program for students enrolled in science classes. Terri has been a developmental reviewer, has written supplemental materials for both textbooks and lab manuals, and is co-author of Eckel/Ross/Bidle, Anatomy and Physiology Laboratory Manual, 3rd edition.